Imagine Media to Disciple Making Movements (M2DMM) like a funnel that dumps masses of people into the top. The funnel filters out disinterested people. Finally, seekers who become disciples who plant churches and grow into leaders come out of the bottom of the funnel. At the top of the funnel, you will have your entire target people group. As your people group uses the internet, they will be exposed to your media content through Facebook or Google Ads. If your content meets a need of theirs or helps answers questions they are asking, they will begin to engage with your material. If you have a strong call to action, such as “Message Us”, some will respond. However, not EVERY person in your people group will use social media or the internet. Not every person who uses social media will see your media, and not every person who uses your media will contact you. This is why it is like a funnel. Deeper in the funnel, fewer people will continue to the next phase. Once they contact you online, it is important that you are prepared to dialogue with them online. Ideally it is best to have a local believer doing the online corresponding, notably someone who shares and lives out the vision you want to see. Start collecting and/or writing resources in their language that answer their frequently asked questions. Have a database prepared with the links to quickly respond. Remember, you want the same DNA present online that you hope to be multiplied in every disciple. Think through that DNA. Do you want Scripture to be their key for how they find answers? Design your responses and resources to reflect those important strands of DNA. For the sake of not letting anyone fall through the cracks, keep contacts and seekers organized so you can quickly check and recall previous conversations, their spiritual progress, and important notes. You can do this in a collaborative software such as Google Sheets or you can demo our disciple relationship management (DRM) software, currently in beta, called Disciple.Tools. It is still in development, but the software is being designed for M2DMM work. As more and more contacts come through the system, you will need to meet that demand with more like-minded multipliers and form a coalition. This coalition will be key to speaking into the quality and effectiveness of your media content as well as identifying the major roadblocks that media could help address. Whenever you have coalition meetings, create forward momentum with field stories as well as discussion of common obstacles and new insights. Partnership presents unique challenges, so be sure to review our recommendations also found in the Offline Strategy Step. You have to start slow to go fast later. Your coalition of field workers will continue to experiment, report, evaluate, and pivot with tools and ministry strategies. Your crystal clear and well communicated vision will be essential for perseverance and unity. Also, keep in mind the seekers’ critical path. If your end goal is to see disciples reproducing disciples, and to start churches that start other churches, keep identifying where in the critical path seekers are getting stuck. Are too many seekers becoming believers isolated from their oikos? What needs to change in your plan to help believers come to faith in groups? What are other fields trying? Consider running a media campaign on the importance of following Jesus in community. Also, think about how your coalition can communicate the vision more strongly to seekers in their first and second follow-up meetings. As people move further and further into the funnel, the numbers will decrease. However, when those committed and vision driven leaders begin to emerge on the other side, they will be able to reach deeper into the people group, helping to connect unplugged communities such as grandparents and parents to the Gospel. Then in the power of the Holy Spirit, disciples start multiplying themselves. Where 2 become 4 then 8, 16, 32, 64, 128, 256, 512, 1024, 2048, 4096, 8192, 16384, 32768, 65536… And that is only if you double. 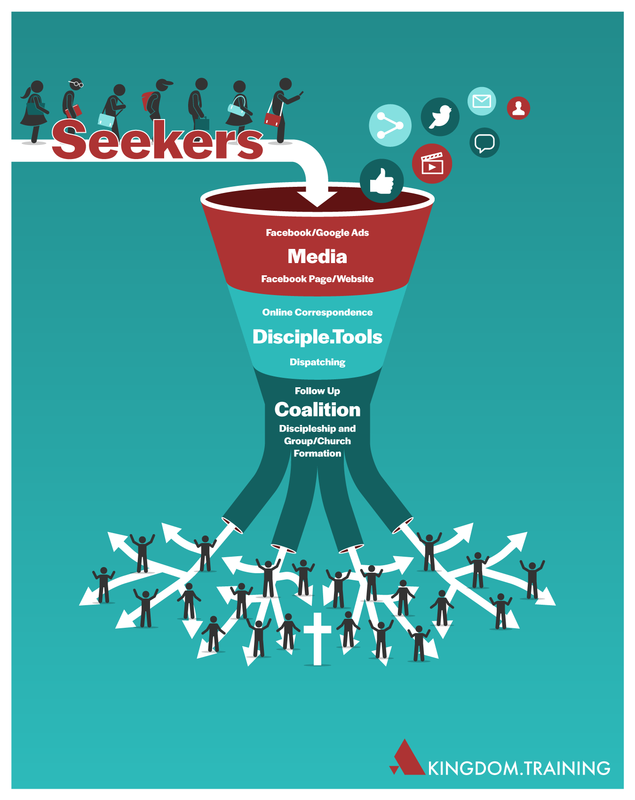 This funnel illustrates the activities that happen as seekers take the initiative to pursue Christ coupled with the response of a disciple maker to coach them in their journey. 0 responses on "The Funnel: Illustrating Media to Disciple Making Movements"